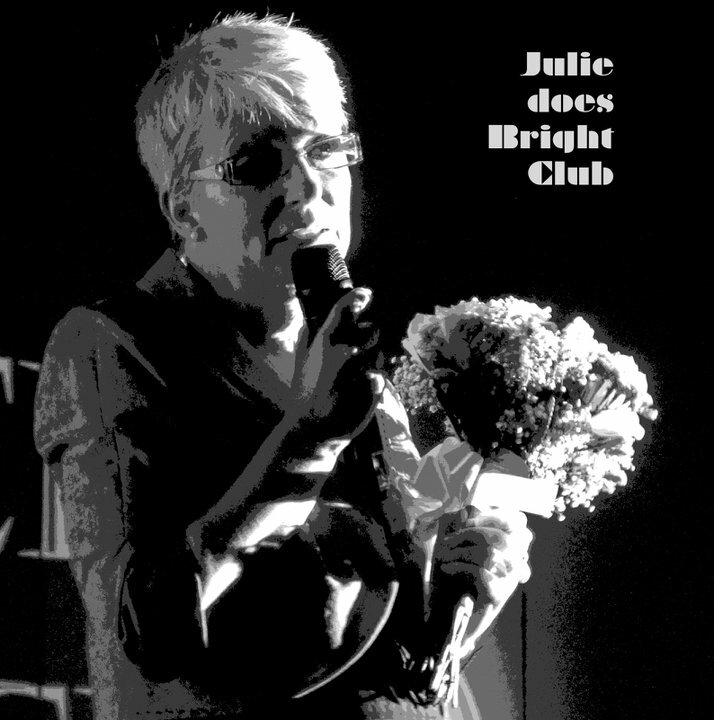 As Project Director for the Beacon for Public Engagement based at UEA, I volunteered to do a comedy stand-up routine for Norwich Bright Club in 2011, along with Professor Tim Jickells, Dr Richard Grey and postgraduate researchers Alessia Freddo and Chris Roberts. Staff and students were joined in the audience by Norwich and Norfolk civic members. I especially recall the late Cllr Jenny Lay, Norwich Lord Mayor who, despite being hit on the head by the bouquet of flowers I threw into the audience, expressed her congratulations on my performance, saying, ‘I didn’t know you had it in you, Julie’. I always admired Jenny’s warmth and compassion and was sad to hear of her passing last year. Whilst the Bright Club experience proved to be more nerve-wracking than any job-interview or presentation, I was on a high for days afterwards. It was an amazing experience which I highly recommend. View the routine on YouTube or read the script below. My act starts 10 minutes in. I hope it raises a smile. Is work making you miserable? Do you want to be happy? Are you becoming restless, depressed, apathetic or cynical? You academics out there…are you resenting your students, your colleagues, your institution even? The other day I found a great service called, ‘Escape the ivory tower’. You can use it to ‘examine your own unhappiness’. Coaching is offered that will let you ‘go deep’ and really explore whatever you’re struggling with. Well, my research does pretty much the same thing. I’m going deep…real deep. I’m going down on 12 very lucky academics. You see, they need to be appreciated. They need to be loved, to feel valued. Yet, in these times when making money rules supreme, we seem to have lost our appreciation of the things that really matter. Such as happiness and pursuing the truth; the truth about things that mean absolutely nothing to the public at large…well, someone’s got to do it. We don’t have enough money to do our jobs properly but we’re really good at them. Can’t think what they mean, can you? We clearly need to boost their morale. We need to make them happy. We need to help them feel connected, somehow engaged. Hmmm engaged…engaged…what makes people happy? Being engaged? Didn’t Kate and Wills meet at University? Did you actually watch the Royal Wedding? What an adoring couple. How nice it is to see two gorgeous young people so much in love. Wasn’t the dress simply wonderful and oh what a stunner. I thought Kate looked fantastic too. Bit caked up maybe. Got to cover up those acne pock marks somehow I suppose. It’s just been announced that the Palace of Westminster will be available for wedding receptions. Well, I’m not talking alternative wedding venue. I’m talking wedding concept, the total wedding package. Never mind the big fat royal wedding. I have the big fat university wedding! Ladies and gentlemen, I give you the UEA Wedding Experience – a complete cradle to grave service. World class, carbon neutral, award winning. For a fairytale experience, UEA’s your concrete castle full of Eastern promise. Explore our labyrinths and exotic subterranean streets. Now I grant you, the venue may not be instantly appealing – more Gretna grey that Gretna Green. So, if you want a quickie, it’s Gretna Gray, destination UEA. A bit of bunting here and there, maybe draped around the scaffolding. Instead of cleaning the concrete, spay it with glitter! But it’s not the venue that makes a classic wedding. It’s all the extras – and don’t we have extras at UEA! Just think of the facilities. Shotgun weddings not a problem. We have a School of Nursing and Midwifery. All services are at hand. I mean, all services…for you shy young virgins who lack confidence in the bedroom department we can set up special observation points around the campus so you can watch the rabbits. You’ll soon learn. Our nursery can provide as many cute bridesmaids and page boys as you like, for an extra one-off payment to the parents. Rates negotiable. For those vital pre-nuptial agreements, our School of Law can offer New Union Practical Treatments Including All Liaison Services – that is, NUPTIALS for short. Speeches. A wedding is not a wedding without speeches. The School of Literature and Creative Writing! There’s a bunch of scribblers who could do with a bit of extra income. Say, 10p a word, 15p if it rhymes – 75p if it’s funny? For speech writing, we can set up the Educational Institute for Engagement in Oratory – EIEIO. Pointless having speeches without a receptive audience. So don’t worry if you’re a little short of guests. UEA can provide a guest list to die for. Any kind you like. Want a refined party with idle chit chat, sipping sherry and nodding sagely – we have pro-vice chancellors, deans, directors and so on. A more cultured lot you could not hope to meet. You want a merry throng, chattering and cheery – we have lecturers and researchers – always game for a laugh. You want a raucous bunch of rebel rousers with a couple of arguments and maybe a fistfight – we have pro-vice chancellors, deans, directors! Wait a minute, they’re in twice. Well, security and maintenance will have to do the sherry and chat. All those wedding guests you have to invite but don’t actually want? We understand that sometimes it’s necessary to invite those relatives that you really have no desire to see. This is not a problem. We have the solution. We will give them a campus map, some emergency rations and tell them to find room 003.01.03. We guarantee that you’ll never see them…ever again. It is not even a problem if have no family or friends. You can tack your wedding service onto one of our Congregation ceremonies, coming up soon with a special Star Trek theme this year. Dust off your Klingon outfit. You won’t look out of place. At UEA we really know how to dress up and you’ll be thrilled with the results. Have your photograph taken with our Vice Chancellor, he won’t mind, I’m sure. Now, I did say ‘low carbon. I don’t mean horse and cart down the Mall – l mean proper low-carbon, environmentally sound weddings. Take the catering. You can have the icing but no cake – there’s a load more food miles in a fruit cake, you know. Think how virtuous you will feel knowing that you’re doing your bit to save the planet. Talking of saving the planet, our School of Environmental Sciences have stacks of shredded emails that would make fantastic confetti. This could be a true Norwich Research Park Enterprise collaboration. The John Innes Centre can grow you GM flowers that will double up as the salad for the wedding breakfast. And if we’re really pushed, we could buy in some half decent catering from City College Norwich. Forgotten to buy something for the lucky couple? Stumped for ideas? The Sainsbury Centre for Visual Arts! They’ve got some very pleasant tat that they can’t possibly want to keep. Anything from cute little Japanese ornaments to those all essential recycled shopping baskets. They could flog a few bits off and make a bit of cash. So, don’t just think of that job satisfaction, all those boosted academic morals. Think also of the cash that we’ll raise. No longer will engagement be accused of not generating cash. Prices range from £9,000 to £9,000. Because we’re worth it. Who will be my first customer, then?